Much better than the forecast! With Ben, Tracey and Chris from pretty much Bridge of Gairn up the track via Abergairn – great Lochnagar views – rejoining the road to Lary. 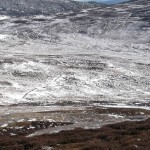 Then we followed the landrover track up to Morven Lodge (cp52). A lengthy stop and one of Ben’s toffees in the sunshine before retracing steps back to the track heading up Peter’s Hill. Took this up a beast of a steep climb but more great views from the top. 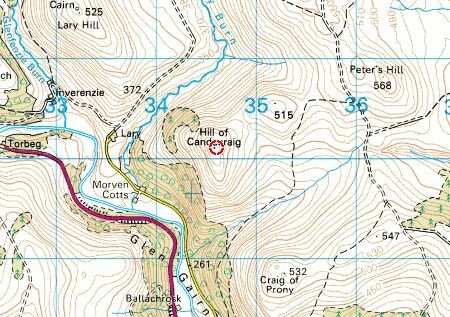 Easy run from there to the top of Candacraig (cp53) before dropping back down SE through less easy tussocky grass to hit the track. From there joined the outward track and headed back to the layby. This entry was posted in cp52, cp53 and tagged RogerC on July 16, 2015 by site_admin. Parked about 1.5 k before Lary, to even out the tarmac running at start and end of run. 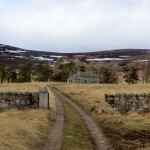 Ran out to Morven Lodge and then up the track to Peter’s Hill, and then followed the track across to Hill of Candacraig, where I found an orange handled bow saw in the heather with well rusted blade. Not one for walking past litter, it was duly carried off the hill! 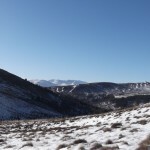 Wonderful view up Glengairn – see photo. Descended due SE over the ruined Glenbardy settlement, and picked up the Glenbardy Burn track to the road – good descent route. This entry was posted in cp52, cp53 and tagged Warren on June 1, 2015 by site_admin. Ankle been playing up so fancied a gentle run. The track up the dale of Lerry Burn was indeed gentle. From the Lodge continue return back down the valley for a bit before crossing the river and heading gently up to the Hill of Candacraig. Descent by the east ridge to cross river and short climb back to the road. This entry was posted in cp52, cp53 and tagged Duncan on April 25, 2015 by site_admin. 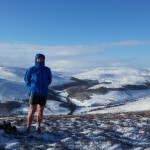 From Morven Lodge onto Canadacraig by same route as previous challengers. On way over to Candacraig we spotted three birds which (following research on RSPB website) we think were “Golden Plover – Juvenile”. They had a very short piping call, almost like a door squeaking. Looked at Jon/Sarah route off Candacraig but opted for MarieE as a safer option. 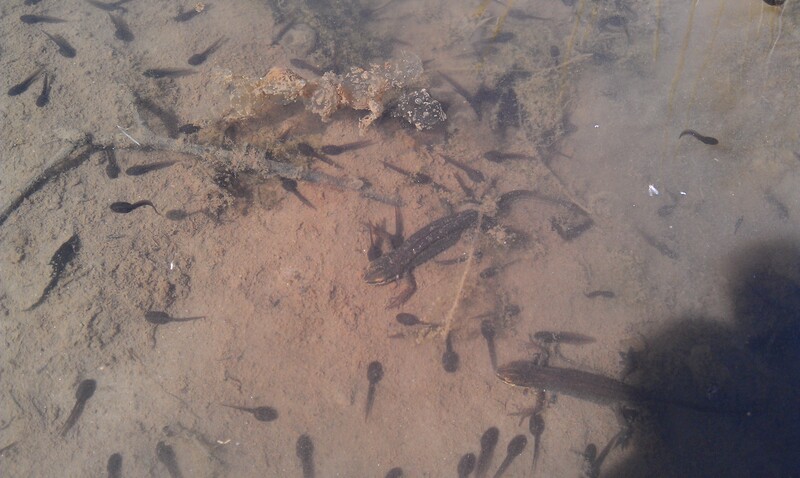 Didn’t see MarieE frogs but puddles with mixed wildlife. This entry was posted in cp53 and tagged D&E on April 21, 2015 by site_admin. 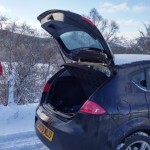 I crawled out of my cocoon and drove to Candacraig ,the weather getting more snowy the further West I went. Kept going as I had already done the nice easy cps locally. Had planned to be out in the 2 hrs of good weather forecast , but had to put on full winter gear and head off in a blizzard. From Candacraig Headed straight up through boulders ,Heather and trees. Blizzard on top. Turned for descent into the wind and snow. Reached the road and the sun came out . Watched a flock of white doves swirling in the sky, then cooing happily. This entry was posted in cp53 and tagged JaneO on April 1, 2015 by site_admin. This entry was posted in cp52, cp53 and tagged JonM, SarahD on March 5, 2015 by site_admin. A much better day of weather than yesterday, so off up the Hill of Candacraig, going from Glenbardy off the Lary Road, up the side of the old farm and village site. I figured a lot of snow would have gone by today, but it was still a struggle, hence the title of this post. How they got up this hill a week ago is beyond me. Higher up it was better, as the snow had been blown off the shoulder of the hill, and from the summit the views all around were spectacular. 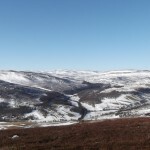 I hoped for a few birds of prey but saw only a pair of ravens and a couple of red grouse. 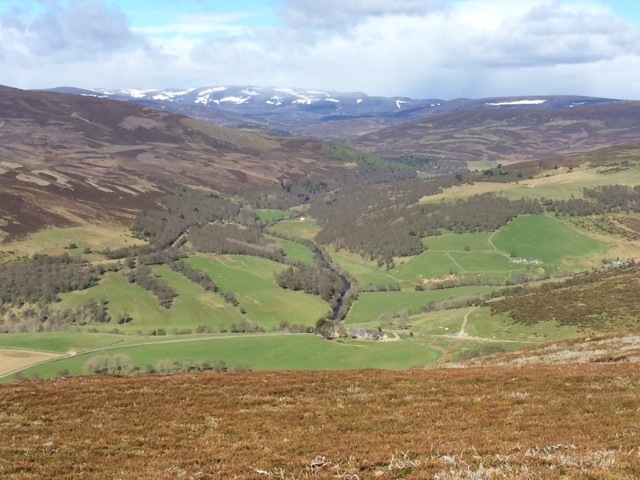 The photos show one of my favourite views of Lochnagar from Glenbardy, the dykes of the old farming community, and a view of Glengairn and the Cairngorms. This entry was posted in cp53 and tagged Phil on February 8, 2015 by site_admin. Update to include photos – better luck this time. This entry was posted in cp53 and tagged Andy, Steph on February 3, 2015 by site_admin. 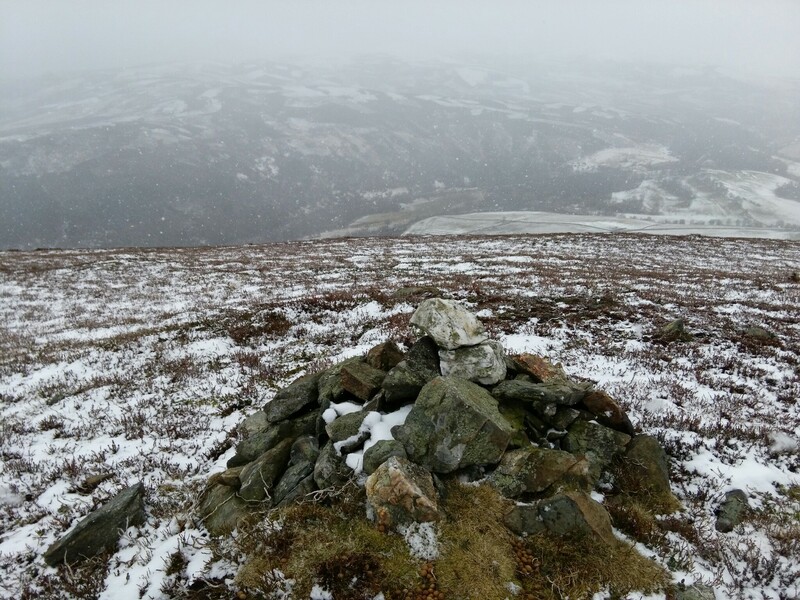 Steph decided that we had to get a challenge point on the first day, I suggested the Stone circle at Tarland and Steph suggested Braeriach so we compromised and went up a very snowy Candacriag. 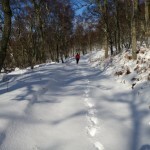 The weather was beautiful down on the Lary road, a couple of inches of snow and no traffic, we headed up into the woods on a lovely snow bound path in the birch trees and proceeded to run (Steph) and plod (Andy) up to the shoulder of Candacraig through deeper and deeper snow. 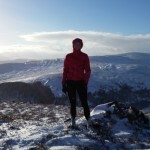 We then climbed straight up to the summit through knee deep snow which was not quite stabilised enough to bear my weight but Steph is several stones lighter and managed to skip over the top of it! 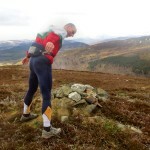 The summit was cold and particularly windy but the views were beautiful, it wasn’t a place for a man in shorts to hang about so we headed off down towards Morven Lodge but the headwind was not much fun so a decision was made to run towards Peter hill and head down to the Pass of Ballater. 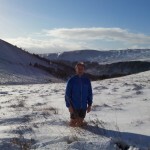 A lovely run down Creagan Riabhach to the road through six inch powder made for a great finish to a slow but entertaining run. One down 99 to go! This entry was posted in cp53 and tagged Andy, Steph on February 1, 2015 by site_admin.